I wandered off to revisit the lovely leaf mural on S. 43rd Street (310 East 43rd Street). But it was gone! Of course the bridge is still there, but there is a new mural. I had to consider it a while before I decided that although it was very different from the leaf mural, I really like it. My first impression when I drove over the bridge, is that it was swirls of colors, but when I took the time to get out of the car, I realized that it was words that said “No One Else But You Can Feel Along the Grooves”. The mural was created in 2013 by David Long. To see the previous mural, go here. This entry was posted in Art -- there is art here!, Tacoma, WA State - Pierce County and tagged 43rd Street, art, David Long, Davon White, eastside, mural, paint, swirls, Tacoma, words on November 11, 2014 by admin. Luckily my friend reminded me that it was Art Mingle this afternoon. I decided to stay out of the main action downtown and go to the only option in Tacoma’s Old Town. 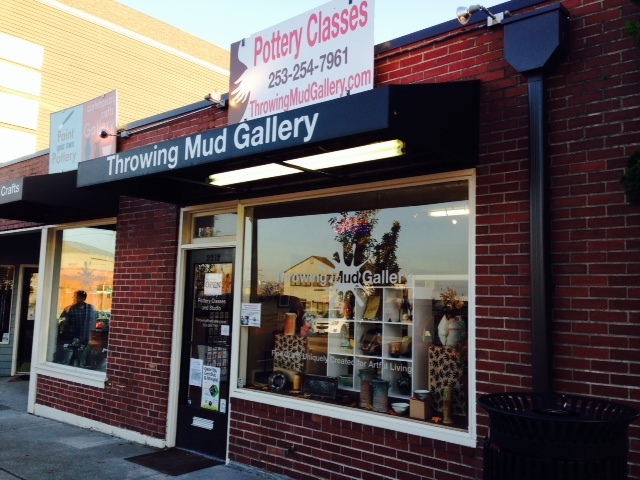 It is Throwing Mud Gallery at 2212 North 30th, Tacoma, WA. They were very pleasant and told me that their gallery items were all regionally made (and really great!). 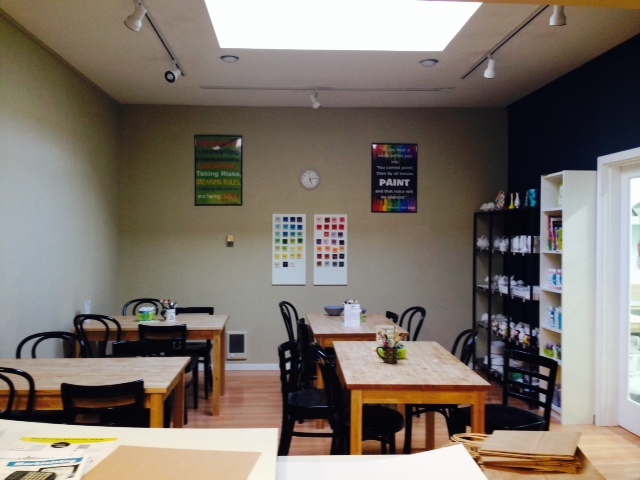 Besides the gallery, there is studio space for throwing pots and painting and a work/party area (pictured). They offer all levels of classes. I was particularly interested in the monthly ladies night out which involves painting, snacks and wine. Throwing Mud’s website is here. This entry was posted in Art -- there is art here!, Tacoma, WA State - Pierce County and tagged art, Art Mingle, gallery, paint, painting classes, pots, Throwing Mud on October 17, 2013 by admin.